A hair care treatment set designed to reduce hair breakage by 94% and increase shine by 75% after a one-time application to chemically damaged, dry, frizzy hair. STEP 1. TREATMENT APPLICATION: Before you bathe, apply RESTORE to dry hair, focusing on mid-lengths and ends. Dispense a small amount onto the palm of your hand. Lightly emulsify product between hands and gently saturate dry hair from mid-shaft to ends. This special process enables the hair strands to absorb the ingredients. Leave on for 1 to 3 minutes. STEP 2. DETANGLE: Now it's time to get wet! 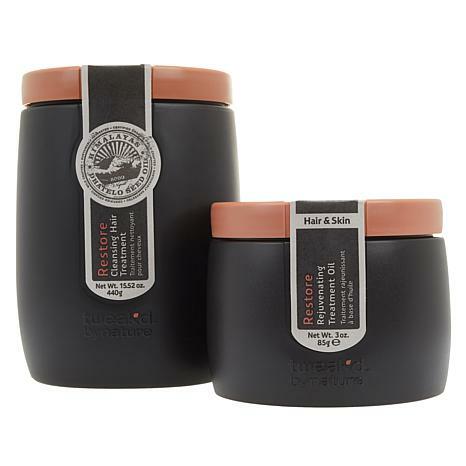 Reapply RESTORE evenly onto wet hair and detangle beginning from your ends to your roots. For optimal results, apply an adequate amount of product to cover hair from ends to roots. STEP 3. CLEANSE: Massage for about 1 minute, starting at the scalp then working through to the ends. Rinse and style as usual. For optimal results, use 1 to 2 times per week. Scoop a teaspoon into your palm, then rub the product between hands until it becomes an oil. Distribute evenly from scalp to hair ends and repeat until hair is fully saturated. Treat your scalp to a one-to-two-minute massage to help stimulate the hair and scalp. Comb through to ensure all strands are saturated. Leave on for 20 minutes or more. Product can be left in overnight by placing a towel over your pillowcase or wearing a shower cap over your hair. Rinse with warm water. Proceed with a shampoo and conditioner or one of Tweak-d's Cleansing Hair Treatments (sold separately). Use once a week or as needed. Tip: The Rejuvenating Treatment Oil also helps to tame frizz, so try one or two drops through your hair to help smooth and add shine. Oil may liquefy at temperatures higher than 86 degrees Fahrenheit. To restore formulation's natural texture, refrigerate product for 60 minutes or allow the product to reach room temperature to solidify. Remove protective disk carefully to avoid spillage. Ingredients: Water/Eau/Aqua, Glycerin, Behentrimonium Chloride, Cetearyl Alcohol, Cetyl Alcohol, Stearamidopropyl Dimethylamine, Prinsepia Utilis Seed Oil, Bambusa Vulgaris Extract, Butyrospermum Parkii (Shea) Butter, Cocos Nucifera (Coconut) Oil, Pentadesma Butyracea Seed Butter, Mauritia Flexuosa Fruit Oil, Argania Spinosa Kernel Oil, Pomaderris Kumerahou Flower/Leaf Extract, Saponaria Officinalis Extract, Aesculus Hippocastanum (Horse Chestnut) Extract, Garcina Indica Seed Butter, Bambusa Vulgaris Water, Soluble Collagen, Kigelia Africana Fruit Extract, Punica Granatum Extract, Lycium Barbarum Fruit Extract, Euterpe Oleracea Fruit Extract, Aspalathus Linearis Leaf Extract, Aloe Barbadensis Leaf Extract, Ficus Carica (Fig) Fruit Extract, Panthenol, Hydrolyzed Quinoa, Silk Amino Acids, Arginine, Glycine, Alanine, Serine, Valine, Proline, Threonine, Isoleucine, Histidine, Phenylalanine, Caprylic/Capric Triglyceride, Gardenia Taitensis Flower Extract, Elaeis Guineensis (Palm) Oil, Vitis Vinifera (Grape) Seed Oil, Theobroma Grandiflorum Seed Butter, Hydrogenated Soybean Oil, Brassica Oleracea Italica (Broccoli) Seed Oil, Camellia Oleifera Seed Oil, Citrus Limon (Lemon) Peel Oil, Citrus Aurantifolia (Lime) Oil, Polyquaternium-7, Hydroxypropyltrimonium Honey, Cetrimonium Chloride, Amodimethicone, Polyester-11, Polyisobutene, Cetyl Hydroxyethylcellulose, Dimethicone, Hydroxyethylcellulose, Polysorbate 20, Polysorbate 60, Sodium PCA, Sodium Lactate, Aspartic Acid, PCA, Parfum/Fragrance, Tetrasodium EDTA, Phenoxyethanol, Ethylhexylglycerin, Citric Acid. Im back for more (and this time Im on autoship) because this has made a huge difference in my naturally curly, graying hair! Its finally manageable and smells lovely! Im not dreading the coming summer humidity for the first Wen was good, but Tweakd is BETTER! I love of all there products have bought many and love them all. I love the smell and what it does for your hair. This is probably the best hair product that i have ever used but unfortunately because of my allergies I have to send it back. There is so much fragrance in it that I am having an allergic reaction. It may just be from the natural ingredients in the product but I react to that too. If there is any way to make the product without fragrance I would buy it. I gave it 5 stars because I really love the way my hair looks.